Bellator 183: “Henderson vs. Pitbull” takes place this Saturday night (Sept. 23, 2017) at SAP Center in San Jose, Calif., featuring a main event between former World Extreme Cagefighting (WEC) and Ultimate Fighting Championship (UFC) Lightweight champion “Smooth” Benson Henderson going toe-to-toe with knockout specialist Patricky “Pitbull” Freire. That mixed martial arts (MMA) fight, among others, will be contested inside a cage never seen before in the United States. 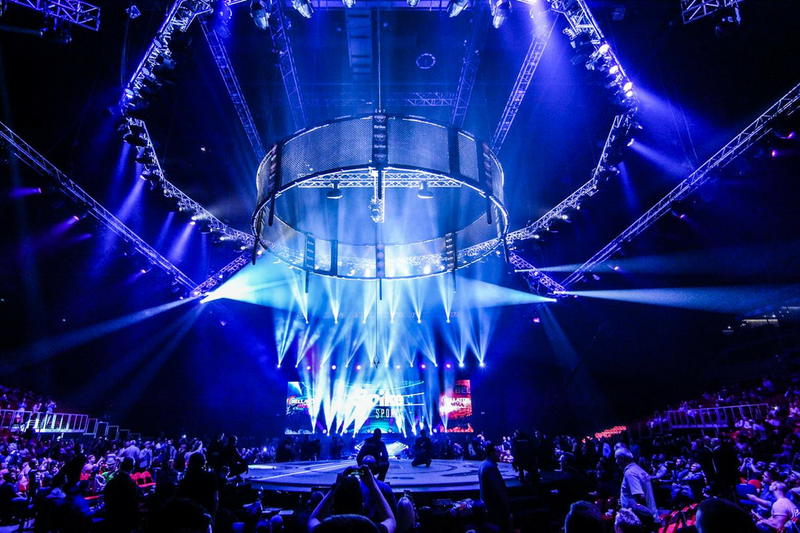 Bellator MMA has used its trademark Bellator “Flying Cage” before at events in Torino, Italy, and Budapest, Hungary, among other far-flung locales, but this will be the first time that a Bellator event in North America has seen this format. The steel structure is suspended over the ring and lowered to a platform underneath, enabling Bellator to change on the fly (hence the name) from a kickboxing ring to an MMA cage. Indeed, the Bellator card set for San Jose that night includes a slew of kickboxing matches set to air at a later date on Spike, including a Featherweight title bout pitting Kevin Ross (44-11) against Domenico Lomurno (22-8) and a Welterweight title bout between Karim Ghajji (98-13-1) and Raymond Daniels (13-3). In other words, Bellator’s “Flying Cage” will be put to good use this weekend. Category: MMA Mania / Tags: Bellator, Cage, Debut, Flying, Jose, U.S.
Fabian Edwards made a big statement in his professional MMA debut. 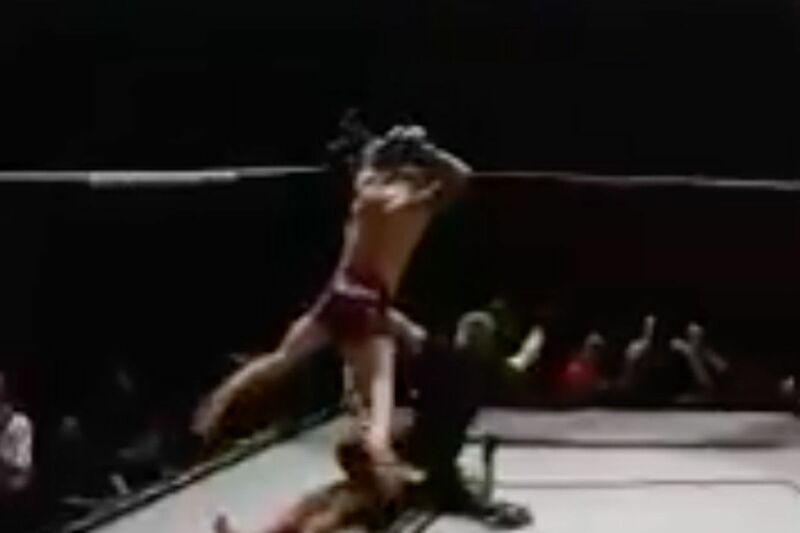 The English fighter brutally knocked out Rafał Cejrowski with a flying knee in his professional MMA debut. Edwards, who fights at in the middleweight division, picked up this impressive knockout on the undercard of Bellator 179, which took place on Friday at the SSE Arena in London, England. Prior to this knockout, Edwards was 9-0 as an amateur fighter. On this episode of the podcast, we delve into UFC Fight Night: Belfort vs. Gastelum. What is next for Vitor Belfort? Should Kelvin Gastelum stay at middleweight? What to make of Edson Barboza’s vicious knockout of Beneil Dariush? We go over this and more on the Monday Morning Analyst. Jose Aldo’s kickboxing trainer scored a devastating knockout in his return to the rings Friday night. Headlining the WGP 35 event in Fortaleza, Brazil, Emerson Falcao only needed 98 seconds to beat Oscar Vera with a flying knee in a non-title fight. Falcao, who returned to action two years after suffering a leg break and undergoing three surgeries, trains UFC featherweight champion Jose Aldo at Nova Uniao in Rio de Janeiro. Falcao is now set to defend his super lightweight championship (142.1 pounds) against Anderson Buzika, who won the interim belt with a unanimous decision win over Guilherme Sanchos in the co-main event. For one thing, Weidman simply deserves this moment. The Long Island native did more legwork than anyone else on the UFC roster in recent years to help get mixed martial arts regulated in New York. He simply deserves to be the biggest-name New Yorker to walk the aisle on the first card at MSG. And that’s before we can get to the fight itself. With Luke Rockhold out of his fight with Jacare Souza, Weidman is in the driver’s seat on earning a shot against middleweight champion Michael Bisping. And Romero, for his part, is sure to be motivated after all the insults he’s endured in the wake of his USADA saga. With a convincing win, Weidman puts all Bisping’s noise in calling out anyone and everyone except the top contenders to rest. (And hey, one more thing … next week, when we hear Madison Square Garden referred to as The Garden over and over, remember that Boston Garden has The Garden beat for championship banners by a count of 23-6. Sorry, couldn’t help myself). @Combat_Artist_X: Will two-division champs become a new level in the future or will long term champs remain venerated above others? Well, we only have one simultaneous, two-weight class major world champion of note in the history of the sport (with all due respect to WSOF’s David Branch), and that’s former PRIDE double titleholder Dan Henderson. That happened nearly a decade ago, and it’s still checked high, if not at the very top, on the list of credentials from one of the sport’s most distinguished careers ever. And Henderson’s accomplishment came with PRIDE going belly up before he got a chance to officially defend titles in his dual-championship role. Who knows how he’d be viewed had he held both belts awhile? Before Conor McGregor in 2016, no one else even attempted to hold titles in two weight classes for seven years. And no one has turned the trick in the UFC. Add all these factors up, and if McGregor defeats Eddie Alvarez at UFC 205, he basically becomes an instant legend (and if he loses and someone else comes along and wins two belts, that guy or gal will become one instead). That said, two-weight-class champs and long-term champs make for a bit of an apples-and-oranges comparison. Anderson Silva’s title reign is remembered so fondly because he was so durable as champion, so dynamic, and set aside so many different types of challengers — including Dan Henderson. If we were listing the pound-for-pound best fighters of all-time, few would ranked Hendo ahead of Silva. Climbing the mountain is one thing. Staying on top is another. Now if someone can win two belts and defend them over a long period of time? Then you’d have your most venerated champion of them all. @DaGr814life23: Will all cards become super cards if they run fewer shows in 2017? The UFC would have to cut waaaaaaay back on the schedule to make every card a supercard. But, make no mistake about it, if the UFC does cut about a dozen shows off their schedule for 2017, as has long been the rumor, and cut, even the bottom 10 percent of the roster, then both the depth and fighter quality on the remaining events can only stand to improve. That won’t exactly give every event UFC 205 and 207′s respective star power, but it also makes it less likely we got stuck with another UFC 206 in between, where one overzealous sparring partner could send the card from pay-per-view to FS1. @Dr_Kwame: Will Ronda fight Cyborg before she retires? After Ronda Rousey came out this week and said that her UFC 207 main event against Amanda Nunes will be “one of” her last fights, Dana White’s proclamation that Rousey will face Cris Cyborg next sure seems to ring hollow. Rousey’s got options for making big money which don’t include taking physical damage (though if she comes back after sitting out a year following her loss to Holly Holm and loses in a bad manner yet again, those opportunities might not continue to be as lucrative or numerous as everyone seems to assume). For all we know, Rousey could call it quits after this fight, or she could go on another big run, or she could land anywhere in between. Even if she believes she’s finished now, the lure of coming back for one more big paycheck against the right opponent has lured back competitors with far less star power than Rousey. All that said, Rousey’s never expressed much desire to fight Cyborg unless it’s entirely on Ronda’s terms, and that was before a Hollywood career beckoned. So while Rousey’s options might be fluid at this point, if I was Cyborg, I wouldn’t hold my breath waiting for the fight to happen. @SprocketDerlo: What’s the likelihood that the fighters association being developed will lead to a union? Who will be on it? I’ve been consistent every time a question like this has been asked of me over the years: A fighters’ union will only get off the ground if the sport’s biggest stars get behind it. The Conor McGregors and Ronda Rouseys are the only ones with the power to singlehandedly effect change. (And I’m not just trying to single them out. I work in the sports journalism business and I’ve never once seen a star sports columnist use his or her platform to advocate for better working conditions for the guy or girl stuck working the overnight desk for short pay. It’s not like fighting is the only business that has one reality for people at the top and another for everyone else). But Donald Cerrone coming out this week and strongly advocating for a fighter’s union is a fairly big deal (As an aside, it should be noted that in doing media rounds for UFC 205 this week, Cerrone didn’t wait to be asked about a union and brought it up on his own at every stop along the way). Cowboy’s not a McGregor/Rousey-level star, but he’s a big name on the card with a huge fan following. If the UFC punished him for this stance, it would be a huge PR nightmare. If Cerrone’s stance leads to a bunch of fighters in his tier — the guys whose presence on the main card makes you decide whether a PPV is deep enough to be worth $ 60 — then maybe that will pressure the fighters at the top to support the idea. If not, then we are back where we started. @MisterOrange_ 17: Yeah, I’ve got a question. is there anything funnier than being 10 pounds over, and still going to the towel? Ricardo Lamas probably isn’t laughing at this right now after Charles Olveira missed weight by an entire weight class. But hey, who among us hasn’t worn 10-pound shorts?